DKJ team has been engaged by the Norther Territiory Government (NTG ) to prepare detailed design and documentation for an IBA KIUBE CYCLOTRON at the Alan Walker Cancer Centre. A cyclotron is a complex piece of equipment used in medical imagining and treatment of cancer operation of a cyclotron. The following information is from Wikipedia and will assist you to understand the basis of cyclotron. The first cyclotron was developed and patented by Ernest Lawrence in 1932 at the University of California, Berkeley. He used large electromagnets recycled from obsolete Poulsen arc radio transmitters provided by the Federal Telegraph Company.A graduate student, M. Stanley Livingston, did much of the work of translating the idea into working hardware. Lawrence read an article about the concept of a drift tube linac by Rolf Widerøe, who had also been working along similar lines with the betatron concept. At the Radiation Laboratory of the University of California at Berkeley Lawrence constructed a series of cyclotrons which were the most powerful accelerators in the world at the time; a 69 cm (27 in) 4.8 MeV machine (1932), a 94 cm (37 in) 8 MeV machine (1937), and a 152 cm (60 in) 16 MeV machine (1939). He also developed a 467 cm (184 in) synchrocyclotron (1945). Lawrence received the 1939 Nobel Prize in physics for this work. The first European cyclotron was constructed in Leningrad in the physics department of the Radium Institute, headed by Vitaly Khlopin (ru). This Leningrad instrument was first proposed in 1932 by George Gamow and Lev Mysovskii (ru) and was installed and became operative by 1937. In Nazi Germany a cyclotron was built in Heidelberg under supervision of Walther Bothe and Wolfgang Gentner, with support from the Heereswaffenamt, and became operative in 1943. 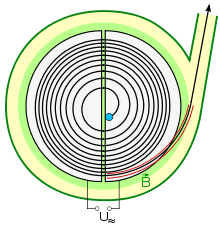 Diagram showing how a cyclotron works. The magnet’s pole pieces are shown smaller than in reality; they must actually be as wide as the dees to create a uniform field. Diagram of Cyclotron Operation from Lawrence’s 1934 patent. The “D” Shaped electrodes are enclosed in a flat vacuum chamber, which is installed in a narrow gap between the two poles of a large magnet. Sketch of a particle bring accelerated in a cyclotron, and being ejected through a beamline. A Cyclotron accelerates a charged particle beam using a high frequency alternating voltage which is applied between two hollow “D”- shaped sheet metal electrodes called “dees” inside a vacuum chamber. The dees are placed face to face with a narrow gap between them, creating a cylindrical space within them for the particles to move. The particles are injected into the centre of this space. The dees are located between the poles of a large electromagnet which applies a static magnetic field B perpendicular to the electrode plane, The magnetic field causes the particles’ path to bend in a circle due to the Lorentz force perpendicular to their direction of motion.